Attending the ribbon-cutting ceremony for Aquinas Literacy Center’s new site are, from left, Cook County Commissioner Jesus “Chuy” Garcia, State Representative Theresa Mah, Aquinas Literacy Center Executive Director Alison Altmeyer, Program Director Meg Green, and volunteer Tutor Rita Janco. 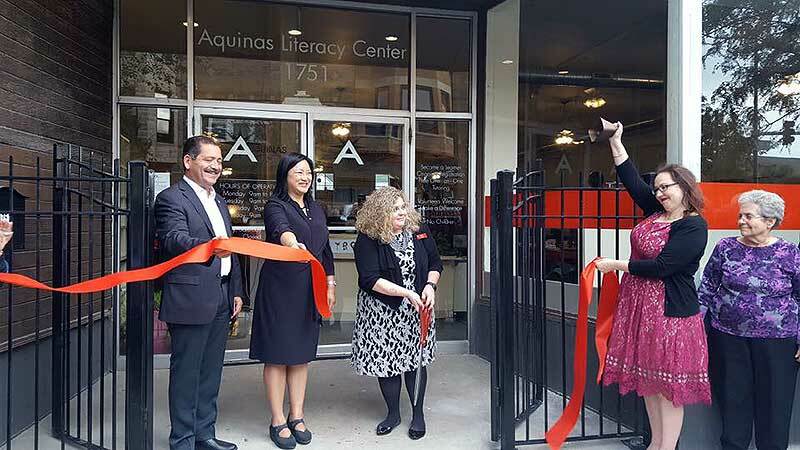 September 22, 2017, Chicago – Aquinas Literacy Center celebrated International Literacy Day, September 8, in a very special way – with a grand opening celebration for its new site. Sister Kathleen Klingen, OP, Chapter Prioress of the Adrian Dominican Sisters’ Midwest Mission Chapter, based in Chicago, opened the celebration with a heart-felt blessing. Officiating at the ribbon-cutting ceremony were Cook County Commissioner Jesus “Chuy” Garcia; State Representative Theresa Mah; and Aquinas staff members: Alison Altmeyer, executive director; Sabrina Poulin, volunteer coordinator; and Meg Green, program director. “It was a perfect evening, [celebrated by] learners, volunteers, neighbors, supporters, political leaders and 19 Adrian Dominican Sisters,” Alison wrote in an email describing the event. The Adrian Dominican Sisters opened Aquinas Literacy Center in 1996 in the basement of the convent at Our Lady of Good Counsel Church. Aquinas has grown from a small center with two tables and five chairs to one that continues to offer tutoring in the English language. “Aquinas Literacy Center has bridged the cultural divide in the McKinley Park community by offering English as a Second Language instruction to adult immigrants,” Alison said. One-on-one tutoring is supported by programs such as conversation classes, book clubs, writing workshops, computer learning opportunities, and job assistance workshops. For more details, read this article by Joe Ward in DNA Info.